Mr. Hugh D. Bogue, 87, went home to be with his Lord Saturday, March 23, 2019, at Moses Cone Memorial Hospital. 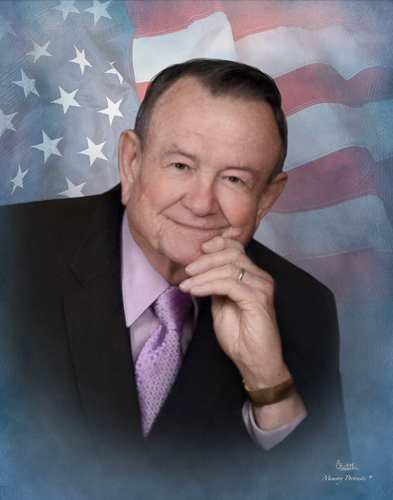 Funeral services will be held at 2:00 p.m. Saturday, March 30, 2019, at Rocky Knoll Baptist Church with Jimmy Jones, Senior Adult Pastor, officiating. Interment will follow in Guilford Memorial Park. The family will receive friends Saturday from 1:00-2:00 pm, prior to the service at the church. Hugh was born July 14, 1931 in Wayne County to the late Benjamen Franklin and Ella Mae Lancaster Bogue. He was a member of Rocky Knoll Baptist Church and a veteran of the US Army during the Korean conflict. In addition to his parents, he was preceded in death by his wife, Peggy Ann Crawford Bogue; a daughter in law, Ruthie O. Bogue; 3 brothers and 4 sisters. Survivors include 3 sons, Danny Bogue (Betty) of Hickory, Dennis Bogue (Robin) of Greensboro and Chris Bogue (Sheryl) of Burlington; a brother, Thomas Bogue (Glennie) of Stantonsburg, NC; 6 grandchildren, Caroline, Kara, James, Mark, Kristen and Brandon; 5 great grandchildren, Arabella, Ellory, Kate, Laitham and Trevor. In lieu of flowers, memorial contributions may be made to Rocky Knoll Baptist Church, 501 Kirkland Street, Greensboro, NC 27406 or to Truth For a New Generation c/o Alex McFarland, PO Box 485, Pleasant Garden, NC 27313. George Brothers Funeral Service is assisting the Bogue family with funeral arrangements.